Lawn edging gives your landscape a professional, finished look. With so many options available today it can be difficult to decide what kind of lawn edging is best for your needs and your budget. Let's take a look at the benefits of edging your lawn and preview some of the alternatives that are available to you. Lawn edging does more that just provide aesthetic benefits. Even though a nicely edged lawn provides a tidy, clean look to your landscape, there are other compelling reasons to install permanent edging around your lawn. 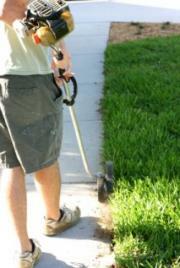 You may have an electric lawn edger that you use every time you use your lawn mower. You may also agree that using it can be a tedious chore. Installing something more permanent will save you both time and labor. Additionally, using lawn edging will help keep the mulch in your garden beds and off of your lawn. Depending on the type you choose, lawn edging can also provide a root barrier to keep grass and weeds from invading your garden beds. This is another welcome labor saver to most gardeners. 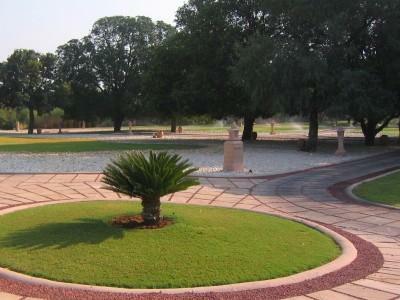 Considering what you want to accomplish with your edging, how much you are willing to spend, and the look you wish to achieve will help you significantly when making a decision on what kind of lawn edging you need. Do you just want something that looks pretty around your flowers? Maybe an edge that will (hopefully) discourage Fido or the neighbor's cat from digging in your flower beds? You may be happy with some simple wire fencing to go around each planting area. While not the most durable material, and certainly not a root barrier, wire fencing provides a cute look for your garden. It is easy to install and take down, and cheap to replace if it gets damaged. This is also a good choice if you are renting and can't install something more permanent. Plastic serves a similar purpose as wire fencing. It is relatively easy to install and comes in several variations. Most types will have a sharp edge that is pushed into the edge of your grass. The top if it sticks up to create an edge that can look like bricks or stone. This type of edging comes in colors like gray, tan or green. Normally, plastic edging needs to be gently hammered into the ground. It comes in sections that easily attach to each other to create a continuous edge. Another type is black plastic edging that is pushed down into the ground. An example of this type of edging is Master Mark, which can be found at Home Depot. This edging will provide a root barrier but requires a bit more work on your part. In order to install you will have to dig a trench around the area you wish to edge. A trenching machine can be rented for this job if you prefer. More durable than previously mentioned methods, if your goal is to simply provide a barrier that is virtually invisible along the surface of your lawn; this is your type of edging. In addition, you can purchase a similar edging in aluminum for even longer lasting durability. If your goal is to create a decorative finish, you will want to consider landscape timbers, railroad ties or bricks. Each of these will provide a different, distinctive look. Your choice will depend on the look of your home and the rest of your landscape. These are more labor intensive options that will be more costly as well. A permanent edging option that will be the most labor saving in the long run is concrete edging. Concrete lawn edging provides great versatility because it can be shaped any way you want it to be. It is extremely durable even if you hit it with your mower and it can be customized to complement any landscape. Another benefit to concrete edging is the ability to stain and stamp with a variety of lovely designs. Create the look of brick or stone without the hassles of weeds that tend to grow up through real ones. Concrete lawn edging is permanent so be sure of its placement before you proceed to install it. Once installed, concrete edging will provide many years of maintenance free beauty as well as adding value to you home.